"Watson, come here; I want to see you.” It was eight simple words, but they were words that changed the world. Alexander Graham Bell and Thomas Watson had been working on their “electronic speaking telegraph” when Bell heard some noise over the device and called for his assistant. Little did he know that his simple request on March 10, 1876, would be the beginning of something incredible. Bell had been submerged in voice study and mechanics from the moment he was born on March 3, 1847, in Edinburgh, Scotland. 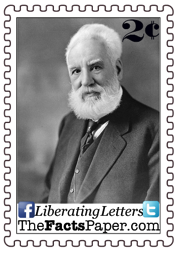 Both his grandfather, Alexander Bell, and his father, Alexander Melville Bell, were experts in elocution, or the skill of speaking clearly and articulately, for the deaf. His father was also a wizard at the inner workings of the voice. This influence, along with the fact that his mother, Eliza, was hard of hearing, greatly inspired Bell to pursue an interest in assisting the deaf. Eliza, an accomplished pianist despite her severely impaired hearing, home schooled her son until age ten and instilled in him the characteristic of never backing down from a challenge. Bell's passion for working with the deaf moved him to Boston, Massachusetts, a year later. He had several teaching positions working with students like Helen Keller and his future wife. It was out of his desire to help the hearing impaired that led to his most successful inventions. Bell’s study and experiments with the human ear and voice, including their inner workings, along with his enthusiasm for electronics, birthed the idea of the telephone. It started when Bell was working on a system that would allow multiple telegrams to be sent over the same wire. He obtained two benefactors to fund his work, one of which would eventually become his father-in-law. A student of vocal mechanics, Bell quickly became fascinated with the idea of transferring not taps and codes, but the human voice, over wires. His financial backers hired Thomas Watson, a talented electrician, to keep Bell focused. While Watson tried to keep Bell’s attention on the telegraph, his own curiosity and personal skills pulled him into Bell’s new idea. Not long after, the investors were hooked too. Having built a device, Bell was still perfecting its ability to actually transmit sound when his attorney submitted a patent application on February 14, 1876. On the same day another application was filed by Elisha Gray to begin working on a similar machine. The patent was awarded to Bell on March 7, 1876. Three days later, while tinkering with his new device, Bell called for his assistant to come and hear the new sounds emitting from the receiver. To their surprise, Watson heard the request as clear as a bell on the other end. Over the next several months, Bell and Watson traveled the country demonstrating the new invention. On July 9, 1877, the Bell Telephone Company was organized and two days later Bell married his former student, Mabel Hubbard. Bell took his young bride to Europe and they spent a year-long honeymoon touring England and France demonstrating the telephone. That same year, Thomas Edison added a microphone to the device so users did not have to yell into the receiver. Bell's popularity was overwhelming at the time. He could have had a very lucrative career with the telephone. Instead, he left his Bell Telephone Company for others to run and he returned to his passion, inventing and helping the deaf learn to speak. His efforts produced the audiometer, allowing doctors the ability to test a person’s hearing for the first time. In 1890, he established the American Association to Promote Teaching of Speech to the Deaf. He continued his work with sound by perfecting the phonograph. In 1880, France awarded Bell the Volta Prize, which included a monetary reward of 50,000 francs. Bell used his prize money, valued today at approximately $250,000, to create Volta Laboratory in Washington DC, as a center for scientific discovery. It is here that Bell produced the photophore, which transmits sound using light. Though it would take over 100 years before this technology became practical, it is the genesis of fiber optics. The institution also birthed Volta Bureau in 1887, which eventually became the Alexander Graham Bell Association for the Deaf and Hard of Hearing, a top organization on researching and teaching of deafness. After installing a phone in the White House, Bell became friends with President James Garfield. It was no surprise when Garfield was shot in 1881 and the doctors couldn't find the bullet, Bell offered his assistance. He built an induction balance, which was essentially a metal detector. Bell tried to find the bullet but was unsuccessful. An autopsy revealed the bullet was lodged too deep into the President to be detected by Bell's instrument that had been quickly designed and assembled for the occasion. While he was unsuccessful in saving Garfield, Bell was able to tweak and improve the gadget. After introducing it to a group of doctors, surgeons embraced the instrument, which then became a vital tool to saving lives in the Boar War and World War I. Bell did not restrict himself to sound and hearing study. He dabbled in hydrodynamics and aviation as well. Bell was one of many scientists testing and discovering the properties of flight in the 1890’s. His love so continued with the science, especially after the Wright Brother’s success, that Bell formed the Aerial Experiment Association in Baddeck, Nova Scotia, in late 1907. (see I Believe I Can Fly) The association made tremendous advances in design and control of aircrafts. A man of great intelligence and ability to solve problems, Bell was not flawless. As with many scientists around the turn of the 20th century, Bell, a self-proclaimed agnostic, was a student of eugenics. Though he worked passionately with the deaf, he advocated that two deaf people should not marry, as he believed it elevated the probability of producing a deaf child. Since his wife became deaf at age 5 after a bout with scarlet fever, this theory did not conflict with his personal behavior. Like Margaret Sanger, he did subscribe to the notion of required sterilization of those he regarded as the "defective variety of the human race." Bell and his wife spent their golden years at their home in Baddeck, Nova Scotia. It is here he died with Mabel by his side on August 2, 1922. At the moment his funeral was over, every phone in North America fell silent for one minute in honor of its inventor. Bell did not set out to make a telephone. What drove him in the beginning and kept him going till the end was his desire to study, invent, and improve ways for the deaf to communicate. Liberty, find your passion, whatever it is that makes you want to get up every morning and work hard and make a difference, and then do it.